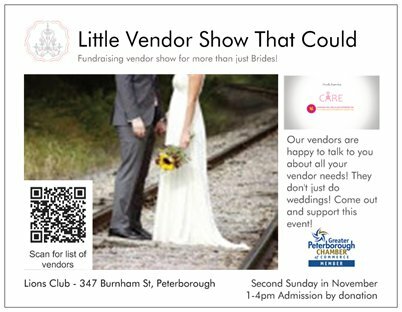 This wedding show is coming up November 13th 2016 from 1pm – 4pm and it is hosted at Lions Club of Peterborough. Little Vendor Show That Could is a wedding show for the little vendors who often don’t have budgets to enter the bigger shows. This does not mean they do not offer stellar products and services. Because they do and this show will show you what they offer and often provide you with budget based options. You can buy tickets online from https://peterborough.snapd.com/#/events/view/989264. The price isn’t fixed and it’s on “pay what you can” basis. All funds collected will go right back into the community. For more info visit http://www.secondstory.love/little-vendor-show-that-could.html or email secondstorywedding@gmail.com.